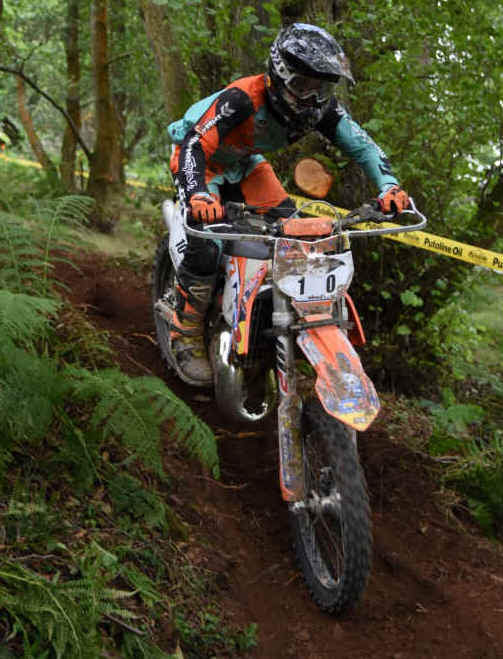 WOR Events unleashed the DOG’s OF WOR last weekend, A brand new Extreme Enduro set in one of their superb, Welsh, Old school Hare Scrambles venues. Carrog ISA in North Wales set in between the picturesque Towns of Corwen and Llangollen was the scene of two individual races, A Saturday Night 2 hr race in the Dark followed by a 3.5hr race on the Sunday Morning. Both races where set on the same track and they utilised a 5-mile course that was bumpy, demanding, strength zapping and of course had an element of achievable and enjoyable Extreme Enduro terrain in them with WOR’s addition of unused and brand-new woodland trails that made up the Bulk of the hard sections in the course. A small but competitive and determined entry of riders took to the start line both races and the feedback from all was 100% good with each and every rider tested in some way or another by the course. Only the fittest excelled as the lap times showed with close racing in all classes. Owain Humphreys on the CF Racing Husky 350f was the Victor in both races … The night time race was his 100%, the Sundays’ race victory became his with other riders’ misfortunes. The Night Race: 7.30pm till 9.30pm. The Atmosphere was brilliant as the riders set off in the fading light and by the time they had hit the new Extreme Woods sections it was truly time for lights on. Early leader and riding very well was Sherco Mounted, Gethin Humphreys, always followed very closely by Older Brother, Owain and KTM mounted Charlie Frost. These PRO riders where on fire and as the full extent of the darkness kicked in it was Owain on the Husky 4t that pulled away and left his Brother as Runner Up, Eventually finishing with a 1 minute and 20 second margin. Charlie Frost’s lights where not quite up to the job and he finished a couple of laps adrift of the Humphreys come the end of the 2hr battle. 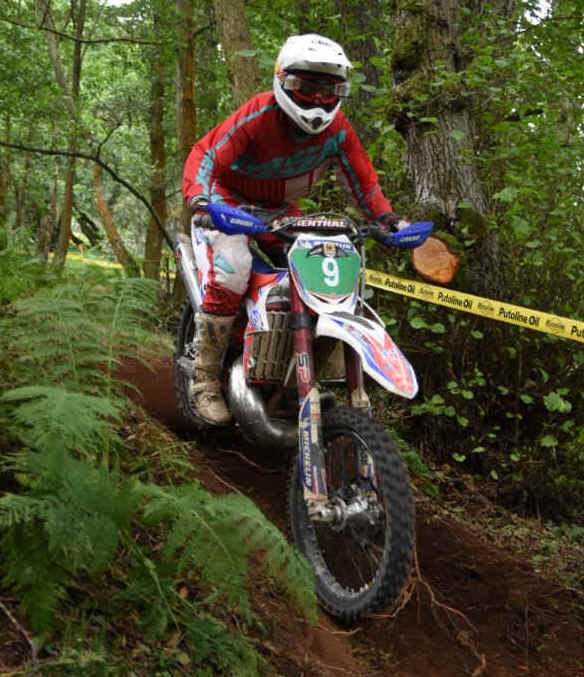 Top Expert was Tim Forman, after a battle with his lights not working early on and a few mishaps in the trees, Forman surged ahead of the group to win his class on his Beta 300 from Runner Up, Robert Crayston. Crayston is just 14 years old and what a prospect he will be if his Father, Neil, Boss man at D3 KTM in Kendall, Cumbria can keep him focused and feet on the ground. Young Robert was flying in the Dark and took a superb Overall placing too as he showed big speed and smooth skill through even the tougher parts of the course. 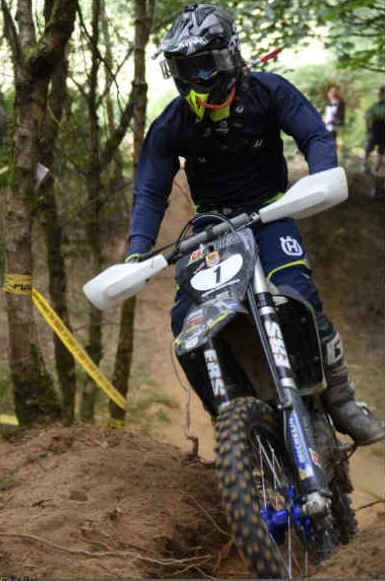 Grant Thomson from the IOM is one of the Hottest Expert riders at the WOR Events in the current series and out on his new GG 300 he once again put himself on the podium and scored some valuable Extremism Series points. Martin Wells was Top Exp Vet. Tom Knight from that legendary family in the Isle of Man was unstoppable in the Clubman class and in fact won his group by 2 clear laps and indeed beat all of the Experts on the night. A chat with Race Boss, Steve Ireland saw Tom Proudly elevate himself to the Experts for the coming Sunday’s race. Steve being very proud that it was one of his WOR races that saw the loveable youngster move up for his first ever Expert ride. Tom Completed 10 laps and was 3rd overall in the DOG’s night race comfortably seeing Gwion Prys and Lee Thomas on 8 laps and in 2nd and 3rd place respectively on the Clubman Podium. WOR stalwart, Gary Benniman put on a class show on his Beta to take 9 solid laps and the Club Vets win from Runner Up, Nick Walter on 7 laps. Gareth Davenport, Hayden Tyrer and Andy Smith where all on 7 laps each in the Sportsman with not much time separating them in that order for the podium places. Well done to all of them for battling hard and being the only riders in the Sportsman to achieve that lap tally. Mick Reece was Top Sports Vet on 7 laps and had 6 minutes advantage over Runner Up, Nigel Lynn. 3rd spot going to Mark Goddard on 5 laps. Goddard celebrating his 50th Birthday the day before and his 23rd Wedding Anniversary on the Sunday, so a good weekend for him indeed. Top Novice was Badger Owen from Tom Goddard with 7 circuits to Owen and 6 to Goddard. A nice awards presentation took place at 10pm with the riders then buzzing about the race as they wandered off back to their campsite and homes ready for the next days battle… 3.5hrs of the same course in the daylight. Steve Ireland and his team have got it nailed in providing Extreme Enduro’s that always come up to the mark, perfectly planned and designed to be achievable and doable for all levels of rider, without smashing bikes to bits and being too hard and more importantly being too easy as some others make them… The Balance has to be right to deliver a challenge that is enjoyable and challenging in the same sentence. This new Extreme Race did just that and the 3.5hr duration of the DAY Race just added to the challenge that the rideable but demanding course provided. 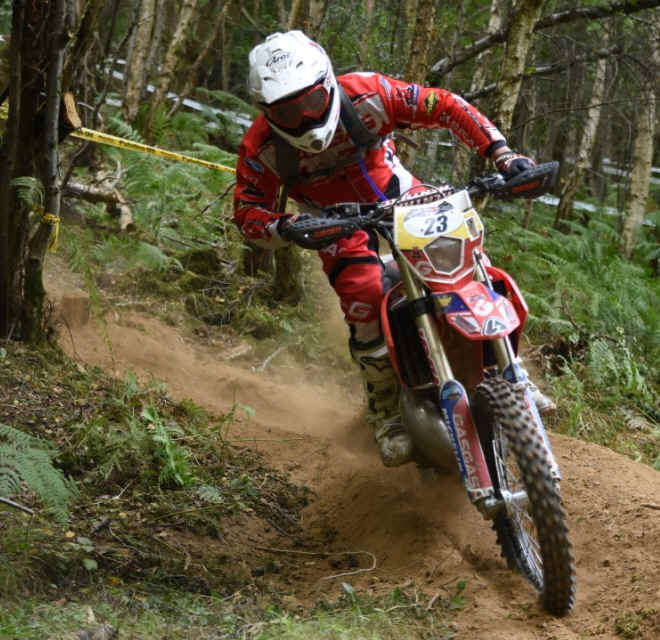 PRO Rider,Gethin Humphreys was on fire on the MRS Sherco 2502t as blasted the Carrog Mountain, Leading from the off he was as expected chased down by the hungry hounds, Charlie Frost and Owain Humphreys. Frost was flying, never letting Gethin out of his sight..lots of big speed was involved and some of his lines where epically chosen on the steep climbs as he kept the hard charging Sherco in his sights. All was not well though as Frost’s Eurotek KTM sounded more and more poorly as the laps passed by and after indeed taking the lead for a short while, Frost was left to unfortunately push the bike over the line at the end from the holding area to get his second 3rd place finish of the weekend. Good Luck to Frosty though now as he gets the bike fixed and heads off for the Sea to Sky in Turkey. Gethin Humphreys once again had the race win in his hands and once again a broken bike has put paid to his challenge. The FMF silencer on the Sherco snapping clean off and forcing Geth into a “push over the line” finish and second once again to older brother Owain. Owain was consistent but sore hands and the superb effort exerted the night before had him casually cruising round in a solid 3rd place but with Gethin and Charlies misfortunes it allowed the cool and collected Owain to take his second top step on the podium in as many days. 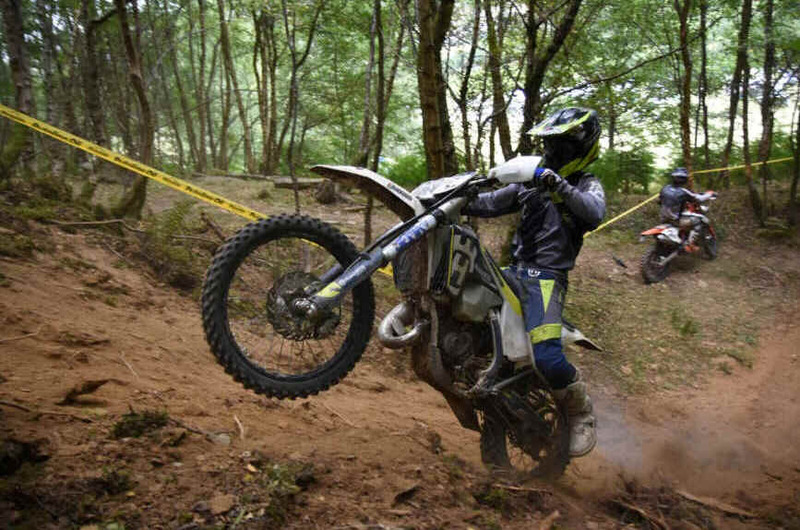 Another strong Extreme Enduro event win for Owain Humphreys and his 350f CF Racing Husqvarna. 19 laps was Owain’s score, Gethin on 16 and Charlie on 13. Tim Forman was again the Top Expert with a win Sunday as he managed to fend off the challenge of Brand New Expert Runner, Tom Knight by 2 and a half minutes. Knight on the GasGas was certainly at home in the Experts and looked good for his score of again a very competitive 3rd overall on the day with Forman and Knight on 19 laps each. Rossi Davies went well to put the 250 Husky 2t in 3rd place in the day race with 18 laps. Young “Burts” Crayston again did no harm to his riding future by posting a solid 4th place Expert and rounded out a very good weekend for a 14-year-old. Lincoln Brewster took the Exp Vets win from Martin Wells on 16 an d14 laps respectively. Top Clubman was Lee Thomas on his KTM with Matt Svensson 1 minute and 12 seconds down as Runner Up. 3rd place Clubman belonged to Ryan Crayston, making up for a DNF on the Saturday evening, Night Race and making sure a couple of trophies went home in the Team D3 KTM camper van. Victory in Sundays Clubman Vets belonged to Simon Nutter from Runner Up, Steve Cranshaw. Top Sportsman was again Gareth Davenport, matching his superb Night result and showing a new, improved, mature way of riding that is now giving results. Well done on the Husqvarna 2t. Runner Up was Will Bates, albeit a lap down on paper on Davenport and making it a Husqvarna Top 3 in class was Andy Smith, Smith matching his superb ride on the Saturday night. Mick Reece again was top man in the Sportsman Vets with Nigel Lynn and Keith Jones in 2nd and 3rd place respectively. Top Novice was Tom Goddard with Luke Ames and Lee Perry in the other two podium places. A massive well done goes out to all the riders with a special thankyou to them for again supporting the events that Steve Ireland and the team put on. SB Xtreme get a massive thanks for sponsoring the event and a huge pat on the back goes to the staff and marshals, the best there is at any event in the Country.